reinstated by George W. Bush— went further by restricting the free speech rights of government grantees and stifling public debate on the contentious topic. Foreign NGOs that accept U.S. funding still cannot perform abortions, but can discuss the options openly with the families they serve. Of course, advocates for increased family planning are pressuring the Obama administration to step up its efforts abroad even more. The Institute of Medicine, one of four government-affiliated nonprofit “academies” of experts, recommended last spring that the U.S. increase its spending on global health by some 50 percent over the $63 billion pledged by the Obama White House over the next six years. CONTACTS: UNFPA, www.unfpa.org; USAID, www.usaid.gov; Institute of Medicine, www.iom.edu; Guttmacher Institute, www.guttmacher.org. 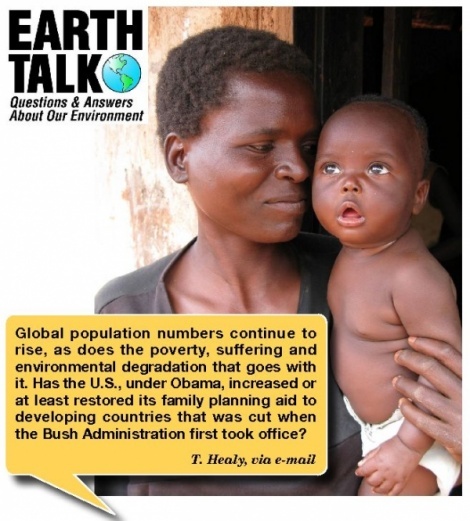 SEND YOUR ENVIRONMENTAL QUESTIONS TO: EarthTalk®, c/o E – The Environmental Magazine, P.O. Box 5098, Westport, CT 06881; earthtalk@emagazine.com. E is a nonprofit publication. Subscribe: www.emagazine.com/subscribe; Request a Free Trial Issue: www.emagazine.com/trial.